Complimentary Wi-Fi and airport shuttle plus an outdoor pool and a location right off the interstate are among the amenities our guests enjoy at the non-smoking Baymont Inn and Suites Shreveport Airport. Renovated 2011 this two-floor property has 118 rooms. All accommodations feature microwaves refrigerators satellite cable TVs coffeemakers work desks and free Wi-Fi. 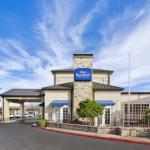 The hotel has a cozy lobby with fireplace fitness facility business center lounge laundry basketball and tennis courts. There's also an outdoor pool and hot tub for further enjoyment. Parking is provided on the house. Pets are permitted for an additional fee. Located near the junction of I-220 and I-20 Baymont Inn and Suites is one mile from Shreveport Regional Airport in Hollywood Heights. Guests can learn about local history at the Louisiana State Exhibit Museum and perfect their putt at two country clubs within three miles. It's a 15-minute drive to Splash Kingdom Water Town go fishing at Cross Lake six miles away or smell the flowers at the American Rose Center five miles from the hotel. Downtown attractions including the Red River entertainment district Sci-Port Barnwell Garden & Art Center and the riverboat casinos are 15 minutes.